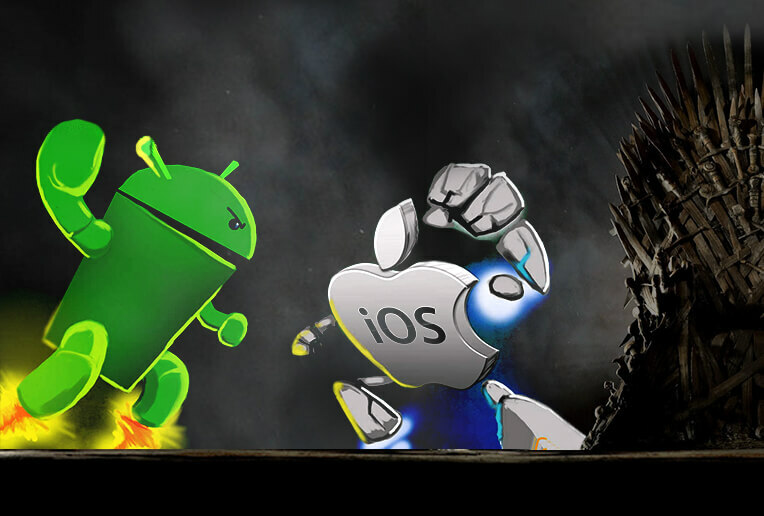 Game of apps: Should you develop for iOS or Android first? The global app business is on the rise and is predicted to reach USD 101 bln in revenues in 2020(more than the GDP of Venezuela in 2017). To stand any chance in such a saturated and competitive market place, having a great idea is not enough: you need market strategy and validation. If you plan to follow the lean Start-up principles and go for MVP and MMP first(see our blog article), the question arise, should I concentrate my efforts on iOS or Android first? Though Apple has between 15 and 20 % worldwide, most apps are launched for iOS first then Android. The beloved photo app Instagram for example launched for Android year and a half after the premiere for iOS. One of the reasons for this is that the App Store generates more revenue than Google Play ($38 bln to $28bln in 2017, data from Sensor Tower). These revenues are generated from 3 main sources– advertising, in-app purchases and Paid-for. Historically the App store users have spent more on apps than Android though the gap is narrowing. Creating a native app for iOS is also easier and faster. There is only of a handful of Apple devices compared to Android ones resulting less variety of screen sizes, operating system versions etc. Hence creating a well optimized iOS app that runs smoothly is easier than creating an Android one that could do the same on the plethora of different devices. That results in faster time to market and reduced costs for an iOS app. There are several occurrences where Google beats Apple and launching firstly for the Android platform would make sense. Android has better world-wide reach than iOS. With 80% market share, if you would like your app to reach as many people as possible and run on as many devices as possible: Android is the way to go. Not a surprise that Google created Android with popularity in mind. The OS is free, and any manufacturers can customize and release Android-based devices. The more devices that run the OS with preinstalled Google Search Engine and other products on it, more revenue for the mother company. What if you can not make the choice and still don’t have the budget for developing a native app for both platforms? If you want the best from the two worlds while still keeping the costs relatively lower, you could go for a hybrid app development approach. Developing the code once and then compiling it for both operating systems offers a lot of advantages. However, one should note that there could be some hidden disadvantages like possible performance and UI/UX issues for more complicated apps. If you are working on mobile, drop us a line and we would help you out. Previous article Getting Lean and Mean: how to create a MVP in 2018? Next article Donatix Named a Top Web & App Developer in Bulgaria!